Assess: Your first step in maintenance should be to give the boat a thorough cleaning. Just use fresh water and a sponge. Spray the boat down, inside and out, give it a good wipe with the sponge, rinse again, and let dry. Next, assess the condition of your boat. First look carefully at the condition of your finish. If your varnish isn’t more than a few years old, and looks to be in good condition, you don’t need to bother with re-finishing. If your varnish is several years old (5-7), or is flaking or looking faded, you should consider doing a full re-finish. Note: Boats that are stored outside, or just see a lot of time on the water, will need to be re-varnished more frequently than boats that are stored inside. 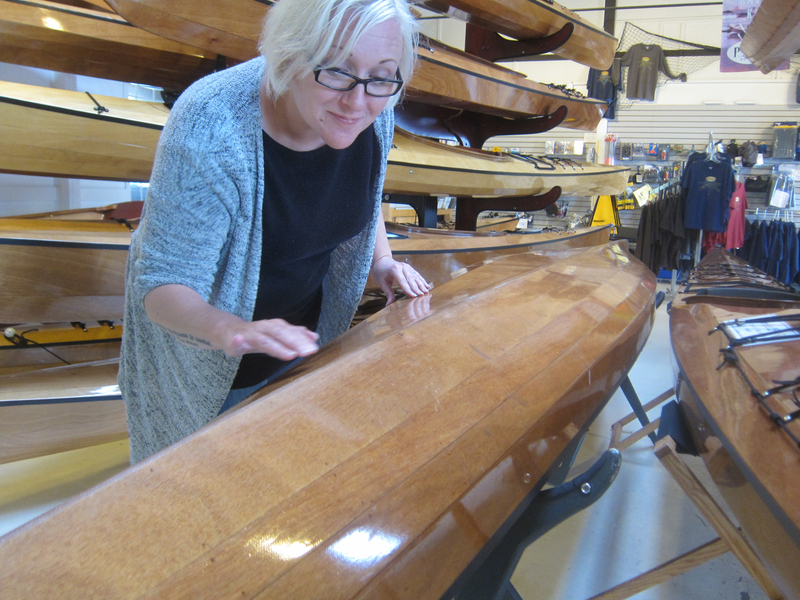 Candace examines the hull of a Murrelet 4PD. Zoomed In: Almost all the scratches on this hull are surface blemishes. 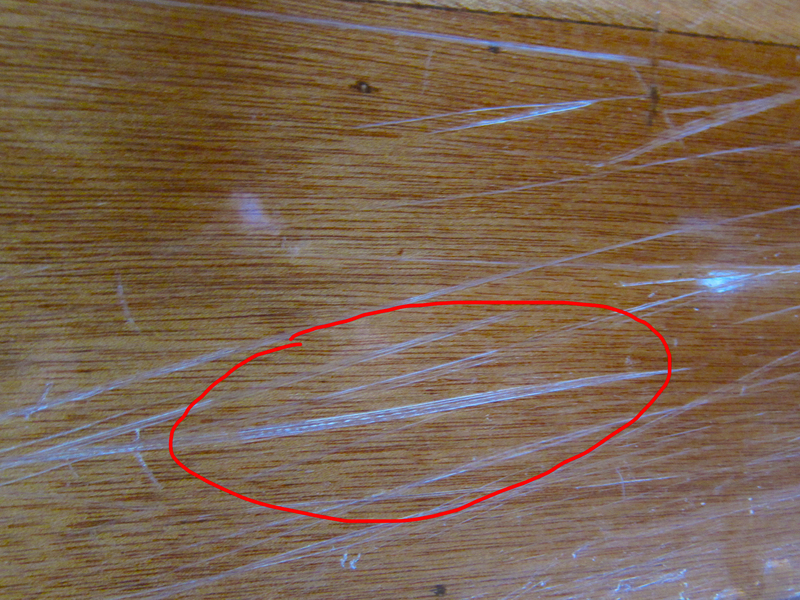 The one circled in red shows some of the weave of the fiberglass and should probably be sealed with a thin layer of epoxy. We like to give our hulls a good look over about once a year and seal gouges or dings such as this one with a small batch of epoxy. Examing the Keel: Most abrasion generally occurs along the keel and even then it is concentrated in the first and last 6 inches. Some people go as long as 10 years before replacing their keel strip while others wear through it much more frequently, depending on frequency of paddling and paddling environment. For those areas along the keel where the sacrificial layer of fiberglass cloth has begun to wear through, you can sand and laminate a strip of new fiberglass tape as you did in the original construction. This should be done before any varnish work. Check for Dry End Grain: Another place to check for wear is the plywood edges along the hatch covers, hatch openings, and coamings. These areas see a lot of use due to spray skirts and the opening and closing of hatches. Check to see that all edges look well sealed with epoxy. Any that look a little raw, or dry, should get a good coat of epoxy brushed over them to re-seal (don’t forget to sand first!). Re-Varnishing: If you have decided to do a full re-finish of the boat you will need to sand the entire boat, but note that it is best to wait 2 weeks after any epoxy work. If your boat has a deck, first remove any hardware and fittings that are installed. It’s a good idea to place all fasteners and fittings into marked zip-lock bags as they are removed, i.e. hatch hardware and fittings in a bag marked ‘bow hatch stuff’, etc. Start with 120 grit sand paper and work up to 220. As you sand, watch the dust that comes off. Varnish dust is amber in color, when the dust turns white you are down to the epoxy. When sanding is complete wash the boat with soapy water or vinegar to remove all the dust and any residue left from the epoxy. Rinse well and let dry. Apply 3 coats of varnish (typically all of a 1 qt can for a solo kayak, 2 quarts for a double or canoe). We like to apply with a 1/8” nap foam roller, then back brush with a dry foam brush. Our number one recommended varnish is Z-spar Flagship Varnish, by Pettit as it is easy to use and has the most UV protection (it is very important if you do not use one of our recommended varnishes that you use a varnish that is chemically compatible with the epoxy). For more information regarding varnish application, be sure to read the directions on the can of varnish you are using. 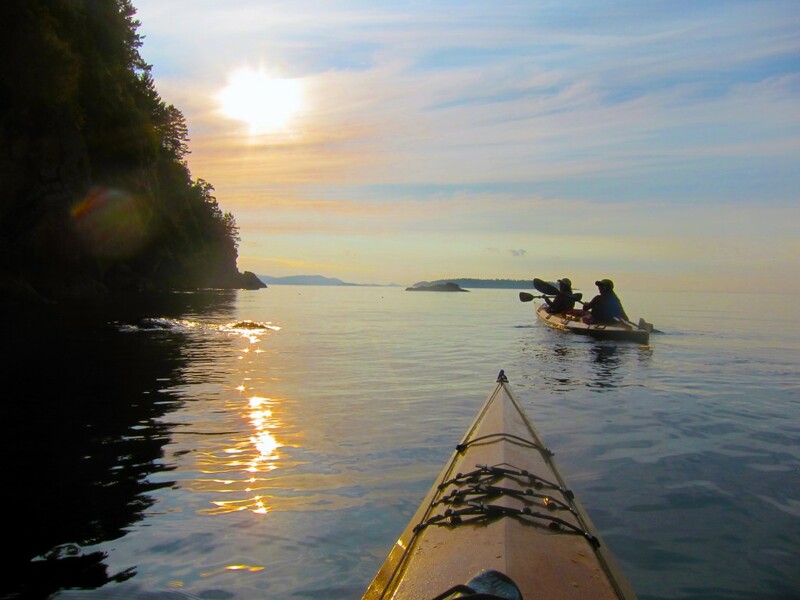 Your boat is now ready to take on another paddling season. Happy Paddling! Pygmy Boats are designed for the rigors of saltwater expeditions and rocky shore landings. With a little upkeep your Pygmy will give you a lifetime of use and adventure.